A small sidebar trumpets the development of “submergence tolerance rice,” expected to greatly increase crop yields in Bangladesh and rescue many of the world’s poor from malnutrition and worse. Dig a little deeper and you’ll find that this rice was produced with precision breeding rather than genetic modification to avoid regulatory testing and public disapproval. For all the advances in gene delivery and plant modification, these remarkable advances are being impeded by societal apprehension and regulatory hurdles. Indeed, in a recent article, researchers at Oregon State argued that onerous paperwork, excessive containment requirements, and legal liability were effectively strangling biofuel and agricultural GMO R&D. Thanks to @idtdna for the pointer. I have no words. If it wasn’t so funny I’d be so sorry. Well depending on what sort of dataset you need for your research today is your lucky day (actually late last week was your lucky day but I’m buried in work and way behind). Download links for lots of apple genome related data are now available from GDR: The Genome Database for Rosaceae. JGI Decides to Sequence Barley! 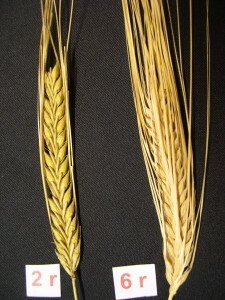 Barley with two rows of grain (left) and six rows (right). Public domain photo by Xianmin Chang via wikipedia. JGI is going to sequence the genome of barley (Hordeum vulgare), a reasonably close relative of wheat, an important crop in its own right, and a monster genome (though not as much of a monster as wheat itself). Barley will be the fourth grass genome sequenced by JGI and the sixth grass genome sequenced in total (baring any secretive grass genome projects I don’t know about, a very real possibility). On the other hand, the barley genome is more than three times bigger than the combined size of all three grasses sequenced by JGI previously. Heck, at five gigabases it’s more than twice the size of the maize genome (one of two grass species, along with rice, sequenced by someone other than JGI)! Now I assume that, like maize (or humans for that matter), a huge percentage of the barley genome is composed of transposons. I don’t know how JGI plans to handle assembling the genome, but I assume they’re be relaying heavily on the genetic maps developed by the barley community. *Estimated based on extrapolation from exactly 2 datapoints so don’t put too much faith in the estimate. If the foxtail millet genome is published early next spring, that will increase to three datapoints.